Nvidia's line-up of Pascal-based desktop graphics cards will soon be complete with the release of the GeForce GTX 1050, and the specs of this low-end model have just been leaked. It'll be based on the GP107 GPU and according to the leak from Chinese site Benchlife, the GTX 1050 will run with a clock speed of 1316MHz with boost to 1380MHz, and 768 CUDA cores with 4GB of GDDR5 memory on board clocked at 1752MHz. The card will boast a pixel fill rate of 42.1 GPixel/s, a 128-bit bus and a bandwidth of 112.1GB/s. That is if the GPU-Z screenshot displayed by the tech site is in fact genuine, of course. TDP is expected to weigh in at 75W, so it's nice and frugal as you might expect, and shouldn't need to be plugged into your PSU. Of course, we've already seen the launch of the GTX 1080 and 1070, followed by the more wallet-friendly GTX 1060 – and most recently, a few weeks ago, a cut-down version of the 1060 which has 3GB of video RAM (half the amount of the vanilla version) along with slightly less CUDA cores and a more affordable price still. The GTX 1050 will sit under the latter and therefore the price tag should weigh in at an appreciable amount less than the GTX 1060 3GB – which is pitched at around $299 or £190 (around AU$335). 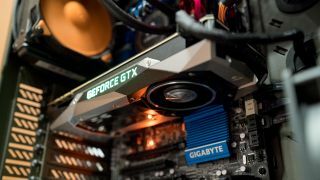 In other words, Pascal graphics power will become even more accessible to the gaming masses looking for a budget option to run their favorite titles at 1080p come next month when, as has been previously rumored, the GTX 1050 is expected to launch.